Mirrorless cameras have risen to immense popularity in the last few years because they offer one crucial advantage over DSLRs: their compact size. Without the internal mirrors like DSLRs, mirrorless cameras have managed to reduce significant amounts of weight, while the sophisticated technology has managed to maintain the image quality. 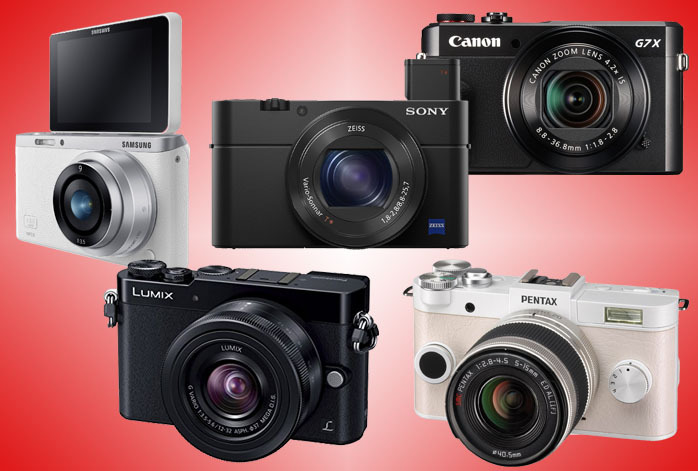 Now, among a bunch of different brands and models of mirrorless cameras, some are still quite relatively heavier than others while some are extremely small and lightweight. If you hate having something heavy to be held perfectly still in your hands, most probably, you are now looking for the best small and lightweight mirrorless camera that you can get from the market. Based on the specs, features, and especially the output quality, we have gathered the best 5 small & lightweight mirrorless cameras below! Sizing barely 2.8” x 1.6” x 4” and weighing only 1.15 pounds, Sony DSC-RX100 IV is a mirrorless camera that is certainly among the smallest and most lightweight models. Despite the compactness and portability, Sony DSC-RX100 IV actually packs a great deal of power and performance! It is armed with a 20.1MP Exmor RS stacked back-illuminated CMOS sensor that is immensely powerful. It is capable of Ultra HD 4K movie recording with direct pixel readout and no pixel binning already, and it also supports super slow-motion HFR (High Frame Rate) movie recording up to 960 frames per second. There are even powerful filming tools, like face detection, focus peaking, smooth continuous AF, and flat profile pictures. There is also a handy viewfinder for better control and framing. Well, it has a fixed lens, so it is not as versatile as the ones with interchangeable lenses. Even so, it uses 24 – 70 mm, F1.8 – F2.8 ZEISS Vario-Sonar T* that is quite reliable for most purposes. There may not be so much of zoom, but the image quality alone is astonishing. In fact, Sony DSC-RX100 IV boasts some of the best image quality ever seen on a compact camera, thanks to the impressive image stabilization system. Sony DSC-RX100 IV features an amazing 1/32,000s maximum shutter speed and a 16-fps continuous shooting mode. Check the best price for Sony DSC-RX100 IV here! With dimensions of 3.2” x 5.7” x 6.3”, Canon G7 X Mark II may be a little bit bulkier than Sony DSC-RX100 IV, but it is also very lightweight with only 1.4 pounds of mass. For sure, it won’t be any serious extra weight in your bag when you are traveling. In general, Canon G7 X Mark II is an excellent compact and portable mirrorless camera with a fast and versatile lens. Powered by the combination of a 20.1MP one-inch CMOS sensor and Canon’s DIGIC 7 image processor, Canon G7 X Mark II boasts solid image quality. It has plenty of colors and details, though usually the RAW performance is better than the JPEG performance. It also relies on a 24 – 100 mm, f/1.8 – f/2.8 fixed lens. It’s got some good zooming range, for sure. Yet, it particularly boasts a superior low-light performance, giving you more control over depth-of-field than most compact cameras. Canon G7 X Mark II also has a decent continuous shooting mode, up to 8 fps with locked focus and 5.4 fps with continuous AF. However, keep in mind that it will require quite some time, about 15 seconds or so, after shooting a burst of images. It also has no electronic viewfinder. Check the best price for Canon G7 X Mark II here! If you want the versatility of interchangeable lenses, Panasonic LUMIX DMC-GM5 is the answer. It is often considered as an ultra-compact and ultra-lightweight DSLR replacement. There is no kidding here; it weighs barely 6.4 ounces and measures only 1.4” x 3.9” x 2.3”! Making it even more attractive, it is available at a relatively affordable price. Don’t be fooled by its portable nature because it is armed with a 16MP Live MOS sensor and the Venus Engine image processor already. The sensor is of the Micro Four Thirds (MFT) type. The image quality is satisfying. It has a viewfinder, and comes with a 12 – 32 mm lens kit in case that you need to start using it right out of the box. Check the best price for Panasonic LUMIX DMC-GM5 here! Samsung NX Mini is another ultra-small and ultra-lightweight mirrorless camera with an interchangeable lens system. It is super slim with barely 22.5mm of thickness and impressively light with 158g of mass. Yet, it’s got quite a decent image quality. It manages to deliver excellent levels of details and sharpness, thanks to the 20.5MP BSI CMOS sensor. It can record Full HD 1080p videos, but, unfortunately, it lacks the 60 fps frame rate. However, it comes with built-in WiFi and NFC for easy and quick file sharing with different devices. The Samsung NX mirrorless camera series is also especially famous for their SMART features. It has convenience features such as built-in social media upload, Photobeam, e-mail, DirectLink, MobileLink, and Remote Viewfinder PRO. It is available in black and white color choices, and comes with either a 9mm lens, a 9-27mm lens, or both – your choice. See also: Samsung NX Mini vs Canon G7X. Check the best price for Samsung NX Mini here! Are you looking for something compact, lightweight, reliable, and affordable? Pentax Q-S1 is the answer. Coming with a 1/1.7-inch, 12.4MP back-illuminated CMOS sensor, Pentax Q-S1 is surprisingly able to deliver decent details and sharpness and solid colors. Quite interestingly, it has an in-body sensor-shift shake reduction mechanism that works with all Q mount lenses. It’s got a maximum 5 fps continuous shooting speed with a respectable maximum shutter speed of 1/8,000s, while the maximum ISO is 12,800. Considering its budget-friendly price, Pentax Q-S1 makes a very good value for the money. Check the best price for Pentax Q-S1 here!